Ph’right is a man of about average height, with an overall slim build with the exception of his almost comically large shoulders. This is only amplified by his tendency to wear clothing with structured shoulders, making them look even larger than they actually are, something that he’s oddly proud of. His face is on the oval side, with relatively soft angles with the exception of a rather defined, square chin. 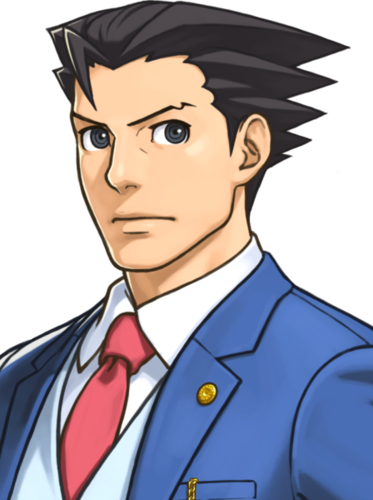 He has wide, dark brown eyes, and almost feminine eyebrows. His hair is black, kept cut fairly short and mostly slicked back save for a single strand that, thanks to a cowlick, refuses to cooperate and falls in front of his face. He loves the color blue, and tends to wear it whenever he can. He also has a propensity to wear rather more formal clothes than the situation might call for, and he’s quite meticulous about ensuring that his appearance is clean. He never allows his facial hair to grow out to a noticeable point (though he doesn’t grow much of it anyway), and he keeps his hair trimmed frequently. Ph’right is, well, he tries to do good. He really does. He considers himself a defender for justice and the downtrodden, and firmly believes in the ideas of fairness and law. He’ll go out of his way to help and stand up for those who can’t stand up for themselves, whether or not he actually likes the person in general, and whether or not they actually want his help. He’s extremely persistent in this particular pursuit, and cannot be dissuaded. However, by ‘defender’, he means speaking in people’s defense; when it comes to any sort of actual fighting, he might try, but he’ll almost never succeed. He’s simply not good at it, and wants to revert to talking. He’s not an especially skilled orator, but he is good at spotting logical inconsistencies and making sense of patterns that are tenuously connected at best, and he’ll use those skills to help those he’s decided to aid. He’s bright, but doesn’t always show it; he’s prone to making logical leaps that aren’t actually there at all, and he’ll proclaim them loudly to all in attendance. When making a point, he has a tendency to yell “I have an objection!” and point at the person he’s disagreeing with. When it comes to things that aren’t in his particular skill areas--that is, logic and sleuthing out the truth no matter what obstacles are in his way--he can be rather inept. Physically he’s not impressive, and his ability to find a Craft that he was actually suited for was near-nonexistent. He almost fit as a Harper, but had no musical talent to speak of. He’s also not especially good at following orders, usually figuring out his own way to do things, and while he strongly believes in law and order, he will bend the rules near to their breaking point when trying to help someone. He’s extremely sarcastic, but that’s one of the few things that he doesn’t immediately blurt out to whoever happens to be listening. His sarcasm, at least, is kept to his own inner monologue, though it’s now shared with Babyloth, whether the brown feels like listening or not. Phenright was the only child of two Harpers, and what a child he was! Precocious and difficult even from an early age, his parents were glad they didn’t have to deal with him all day, though when one of them was assigned to teaching the children they’d have to deal with his constant rebuttals and questions to everything they said or told him to do. He was frequently getting into arguments with the other children, largely on the behalf of one of the youngest children, but occasionally just because he fundamentally disagreed with someone. He got into quite a few wrestling matches before he finally learned that speaking sarcasm out loud didn’t serve him especially well. He still tended to get into near-constant arguments, but those at least didn’t generally end in violence. As he grew older, he learned to turn those arguments into more reasoned ones, with logic to back up his statements, but that didn’t change the nature of them much; it was still verbal sparring, after all. Being near enough to Fort Weyr to toss a ball over to the other locale, they were spared most of the ravages of the war. There were infrequent raids, but for the most part nobody seemed to want to be the ones to attack the Hold that housed both Harper and Healer Halls. Still, he imagined what he would say to those who thought that they could disturb Pern’s peace, even if he could do nothing about it himself. In time though the war ended it, and in its place came Thread. Life continued for Phenright. He helped out in the kitchens with the baking, though as he had little talent for it he mostly helped with the dishes. He was glad to have a use at least, and he certainly hadn't expected his life to throw anything too unexpected in his path. Where? Oh! On you. Of course. Brightest, you should get up. And feed me, your Babyloth. Actually, feed me a lot. And give me lots of love. I need it. Can't you see how much I need it? With that, Phenright became Ph’right, and the pair spent much of their Weyrlinghood learning to deal with the fact that Babyloth’s vision was little more than dark, indistinct smudges. The brown didn't seem to mind in the slightest, but for Ph’right there was an adjustment period, especially when he realized that though the pair could fly together, they'd never fly a Fall. At graduation, they joined the ground crew instead, a fearsome pair that didn't need a flamethrower to take out burrows, but only firestone. They fought Thread with the whers, and did well enough at it. When Benden attacked, Babyloth was so enraged by the brazen attempt on his sister's life that he wanted to go after them himself; Ph’right had to convince him otherwise. 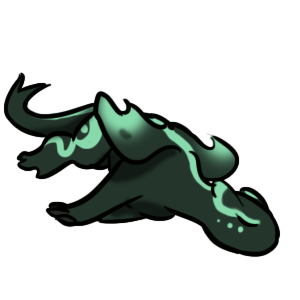 FULL APPEARANCE: Babyloth is a larger Brown, rivaling some Bronzes in size. He is trim but not thin, and muscle ripples beneath his skin. He is strong, even if he doesn't look like it. His headknobs are sharp and pointed like horns, and his wings are large and narrow. He is a light brown color, with a brown-gray color over his face like a blaze on a runner. The same color spreads down his ridges, and over his toes. He has long lines of crescent shapes over the sides of his neck and down to his tail. He's an agile dragon, almost unmatched in sheer agility, even if he's not really able to keep up for overly long flights. 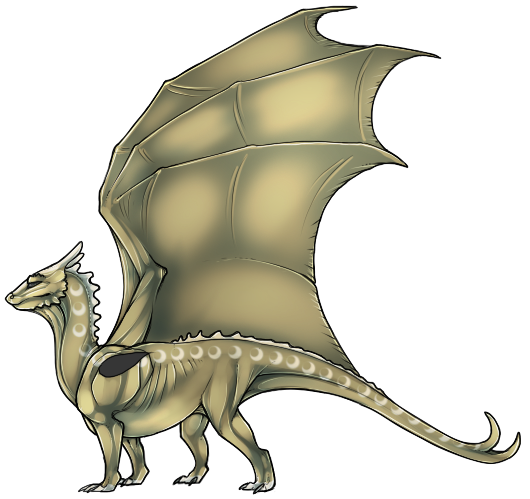 PERSONALITY: Overall, this Brown is a chipper, cheerful dragon. He is chatty, he likes to joke, and he prefers to slack off instead of do his duty. This does not mean he is lazy, he just prefers to do what he wants. When set to task, however, he is very focused and can be extremely passionate about his work. If he has something to protect, he will defend it fiercely, and that same sense of protection is extended to his bonded. However, he prefers to sit and observe, to protect his precious things and watch the world go by. He can be extremely reckless when it comes to getting something done and done right. But if you ever need a wingman, it'll definitely be Babyloth. To his rider, he may definitely get a little pushy about wanting to do his own thing. However, he knows when to stop, and he doesn't try to get too uppity. He definitely has a mind of his own and has no problems being told to shut up and get to work. He may be a joker, but he knows when to push it and when to not. His sight may not be perfect, but he will learn his own coping mechanisms, and will not hesitate to ask for help when he needs it. Voice: Babyloth has a very masculine voice, and he sounds quite handsome. He speaks like a friend, even to those he is not friends with.